Share the post "When Diet + Exercise = Belly Gets Bigger"
You’re not pregnant. You’ve seriously worked out, dieted and used every method to re-establish a six pack, but your belly keeps growing. Take a deep breath. It may be fibroids. Let’s start with the fact that you know you’re not pregnant. Let’s add that you have seriously dieted, worked out, and used every method to re-establish a six pack. Let’s cap it with the concept that this isn’t just estrogen related belly fat. Your belly is growing…and you’re starting to worry. Take a deep breath. It may be fibroids. In which case, no exercise, no fasting, not even Jackie Chan as your trainer is going to solve this problem. If you have fibroids and they are growing inside the uterus, you will not be able to stop abdominal expansion without medical help. The good news? You are no longer forced to face fibroid surgery. More and more women who discover they have fibroids are also discovering embolization. This simple, out-patient procedure uses a ‘starve-don’t-cut’ approach that shrinks fibroids (and your belly) back to a normal, natural profile. To get the skinny on why embolization is the new first choice for well-informed women, we encourage you to explore our website. 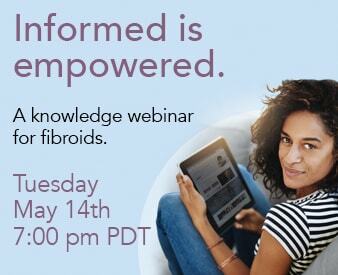 You’ll get information on fibroids, treatment options, and a real patient points of view on why embolization works.